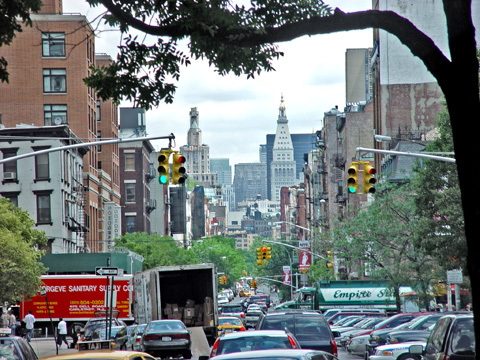 Directly south of Greenwich Village and west of Little Italy, SoHo is a relatively small neighborhood bounded roughly by Broadway, the Hudson River, and Houston and Canal Streets, which are major cross-town streets. 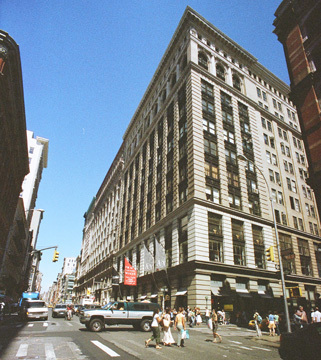 The main street of SoHo is West Broadway, which to the north becomes Fifth Avenue on the other side of Washington Square Park, but the other streets in the district, Broadway, Prince, Spring, Broome and Grand and Wooster, Greene and Mercer are all very interesting, both architecturally and urbanistically.. 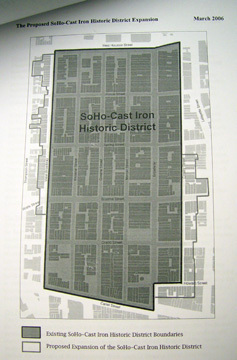 The primary SoHo properties are in the SoHo-Cast Iron Historic District, which was created in 1973 and is bounded by West Broadway, Broadway and Crosby Street, and Houston and Canal Streets. Most of the buildings are fairly old, but very solid and with quiet elaborate architectural designs. Living spaces are among the largest in the city housing many artists, photographers and designers who often work where they live. The area attracted many artists who moved into old and decrepit lofts illegally but eventually so many moved into the neighborhood that they were legalized and the artists attracted art galleries which attracted well-to-do patrons in need of elegant food. Before long, all this success attracted fashionistas and clothing stores began pushing out the art galleries and driving retail rents up. 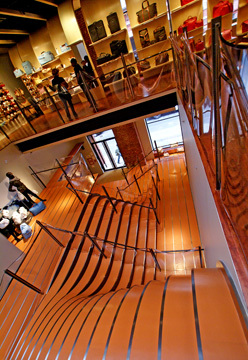 Many of the galleries relocated to cheaper digs in West Chelsea in a rather amazing full swoop. 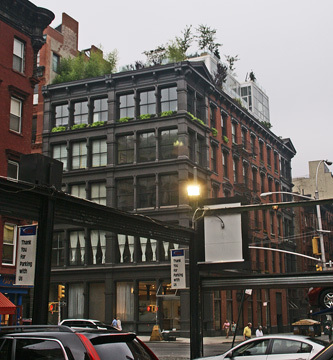 SoHo has better older architecture but West Chelsea became very chic especially with the birth of its High Line Elevated Park and many superb architectural gems began to sprout amidst the former industrial buildings and tenements. Surprisingly, SoHo did not dry up although its character has changed dramatically. Pedestrian traffic is intense with a wild mix of students, tourists, Prada shopper, Dean & DeLuca consumer, and strays from nearby Little Italy, Chinatown and TriBeCa as well as the East Village and Greenwich Village, all of which experienced tremendous growth in the late 1990s and early part of this millennium. Though prices are not cheap, locations not that central and large supermarkets not that frequent many people like this neighborhood for its very quaint, relaxed and somewhat chic atmosphere. Many of the streets are cobblestone and most of the buildings are low-rise although the Trump International SoHo tower on Spring Street created a storm of controversy in 2007 and 2008, not so much because of its height as because of its hotel-condos upsetting some preservationists who were concerned that they were a loophole that would lead to more towers. These former industrial areas had declined severely for most of the 20th Century until artists began to move into many small, older industrial buildings in SoHo (South of Houston Street) in the 1960's in search of inexpensive studios and housing. Fairly quickly, a substantial community of residents were living illegally, because of zoning laws, in the area and successfully pressured the city into changing the zoning to permit "artists" to continue to live in the converted premises. What attracted first the artists and then their followers was the delightful cast-iron architecture of many of the area's low-rise buildings. While Greenwich Village had for many decades had a reputation as a haven for artists, it did not have that many available lofts and it was expensive. Many of the buildings were erected between the 1850's and 1880's. Cast iron parts for the facades were mass-produced locally and this district contains the world's largest collection of such facades, many in the Italianate or French Second Empire styles. The district has several non-cast-iron buildings of distinction as well. 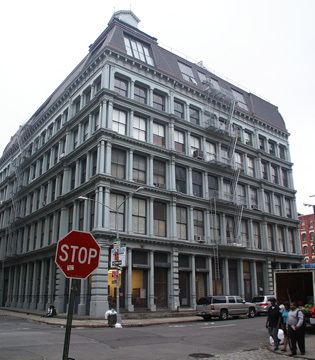 Richard Morris Hunt designed the rather delicate 1874 Roosevelt building at 478-483 Broadway, Vaux & Withers designed 448 Broome Street, Renwick & Sands designed 34 Howard Street. 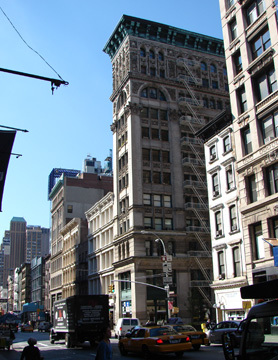 Some of the more important structures are the Haughwout Store building at 488 Broadway, erected in 1857 and designed by John P. Gaynor and restored in 1995, 484 Broome Street, an impressive and massive Romanesque-Revival, non-cast-iron structure designed by Alfred Zucker. The tall building at 587 Broadway is a "kitchen-sink" building because every floor has a different facade treatment. "A proud and handsome, but not egocentric, building here proves that quality does not demand originality for its own sake. Built for Eder V. Haughwout, a merchant in china, cut glass silverware and chandeliers, it also housed the first practical safety elevator, installed by Elisha Graves Otis, founder of that ubiquitous elevator company. The Corinthian columns that flank the arches are sometimes remembered as Serlian, after the drawings and writings of Sebastian Serlio (1475-1554), later lifted by Andrea Palladio (1508-1580) and most elegantly displayed at the Basilica in Vicenza", observed Elliot Willensky and Norval White in their great book, "The A.I.A. Guide to New York City, Third Edition", (Harcourt Brace Jovanovich, 1988). 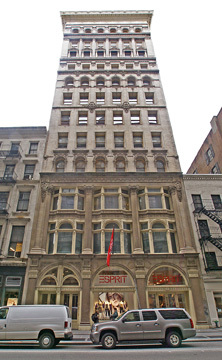 The early cast-iron buildings were cheaper to erect than stone buildings but by the end of the 19th Century developers were beginning to favor steel-framed brick and terra-cotta loft buildings, many of which were designed to accommodate garment factories, including the superb, "L"-shaped, Little Singer Building at 561 Broadway, designed by Ernest Flagg and completed in 1904 with its curved steel braces, recessed windows and fine detailing. The many fine conversions and restorations in this district is one of the preservation movement's great success stories, not only in New York, but the nation, and many credit Margot Gayle, an architectural historian, with much of that success in waging the campaign for landmark status. 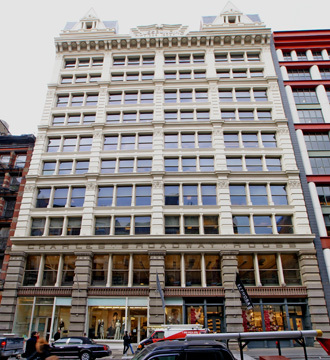 The area's success is not confined to the boundaries of the official SoHo district and Saatchi & Saatchi, the advertising agency, relocated from midtown in the 1980's to a new, large office building nearby on Hudson Street in large part because of the boundless creative energies of SoHo. 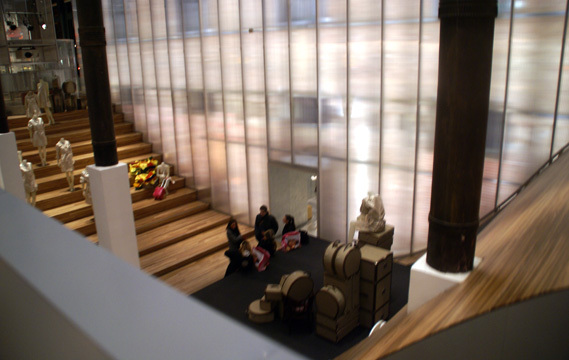 Indeed, in the late 1990's a new hotel was built at the southern end of the district even as many art galleries were beginning to relocate from SoHo to less expensive spaces in the Chelsea district to the north and west. The tremendous popularity of the area took the city by surprise as foreigners flocked to the art galleries and soon chic restaurants and boutiques sprang up to capture their trade and traffic and soon people looked up at the buildings and found them lovely, many with arched windows and high ceilings and that most precious commodity in the city, space. 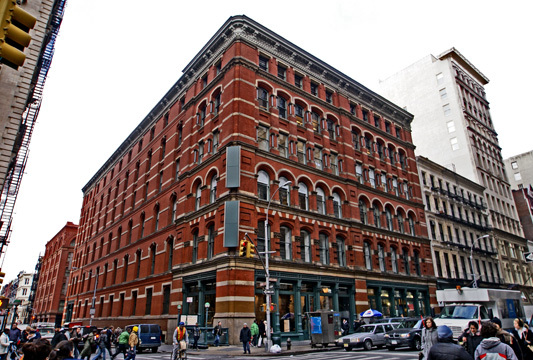 The phenomenon of SoHo would result in the rediscovery and renaissance of several other districts that had fallen into neglect, or at least out of popularity, such as the Union Square and Flatiron Districts and the immense and undeniable desirability of these areas and their excellent architectural legacies was a strong factor in the willingness of many major residential developers in the city to move away from their typical "white-brick monstrosities" that categorized so much of post-war building and to pay at least some attention to "design." Close to SoHo is the small but charming group of fine Federal-style townhousses in the Charlton-King-Vandam Historic District to the west of the Avenue of the Americas. To the west of this district are many large industrial buildings. 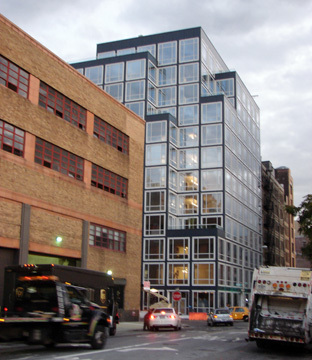 New construction projects included a large dark residential condominium building at 40 Mercer designed by Jean Nouvel with large windows that rolled down,and a slick modern through-block residential condominium at 311 West Broadway by Gwathmey-Siegel, among others. 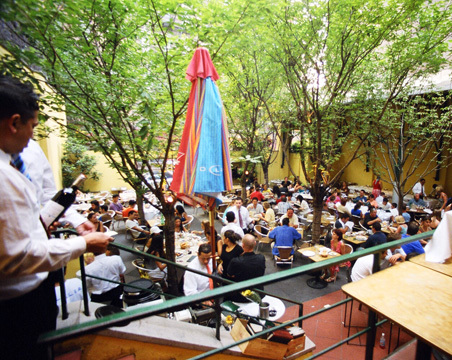 The area abounds in many very popular restaurants included Cipriani's and Barolo on West Broadway, Balthazar on Spring Street, Pravda on Lafayette Street and Public on Elizabeth Street.